An 108-win season at the Major League level can make everyone feel good, top to bottom. This year, that was good news for the Red Sox farm system, where positivity was hard to find, especially early on. Before the season began, No. 2 prospect Jay Groome underwent Tommy John surgery and top prospect Michael Chavis was suspended 80 games after testing positive for a performance-enhancing drug. As the season developed, 2017 first-rounder Tanner Houck rode a roller-coaster performance at Class A Advanced Salem, No. 4 prospect Bryan Mata struggled to find the strike zone (58 walks over 72 innings) and 2018 first-rounder Triston Casas suffered a season-ending thumb injury after only two games in the Gulf Coast League. Still, there were quite a few success stories in the system. Bobby Dalbec (for his power) and Denyi Reyes (for his control) finished the season near the top of Minor League leaderboards, Antoni Flores showed brief flashes of brilliance as a 17-year-old, Travis Lakins successfully moved to the bullpen and Chavis looked like his old power-hitting self after returning to Double-A Portland and Triple-A Pawtucket. Boston affiliates ranked 30th in collective winning percentage around the All-Star break but moved up to 25th with a .470 mark by season's end, though the GCL club was the only domestic entry to qualify for the playoffs. President of baseball operations Dave Dombrowski may have a reputation for depleting a farm system to help the Major League club, but there was plenty of intrigue among those trying to make their way to the Fens this year. Catcher -- Austin Rei, Portland (83 games): Taken in the third round of the 2015 Draft out of the University of Washington, Rei had developed a reputation as a defense-first backstop before breaking out some at the plate in the Eastern League this season. The 24-year-old hit .249/.355/.392 with a career-high seven homers while cutting his strikeout rate from 25.7 percent to 23 percent. With a 112 wRC+, this was the first time over his four seasons in the Minors that he posted an above-average mark in the category. "He really continued to improve at the plate," vice president of player development Ben Crockett said. "He improved at understanding what pitches he could do damage on and did a really nice job of capitalizing on mistakes when they came. That meant taking good risks at times, and with that, he had some really positive at-bats. We're happy with the progress he's making up there." The Red Sox also remain big fans of Rei's blocking skills, though his caught stealing rate slipped to 28.7 percent. At least the offensive breakout couldn't have come at a better time: Rei is Rule 5-eligible this offseason and could have played his way into the 40-man roster discussion with his offensive improvements and continued defensive skill set. First baseman -- Josh Ockimey, Portland (90 games), Pawtucket (27 games): The 10th-ranked prospect earns his second straight Organization All-Star spot, again on the strength of his power. His 20 homers -- 15 with Portland, five with Pawtucket -- represent a career high while his .455 slugging percentage is tops in five seasons in the Minors. The left-handed slugger regressed a little with a .245 average and 149 strikeouts in 481 plate appearances, but he draws plenty of walks (71), leading to a .356 OBP. The Sox are hopeful Ockimey can continue to round out his overall offensive profile. "We're going to continue to employ working on both [hit and power tools]," Crockett said. "He can really impact the ball, and that's something he's shown everywhere he went. Even in a small sample in Pawtucket, it was just a month there, we saw someone who could still make some really good contact. He's someone we think can both hit and slug." With Sam Travis petering out at the upper levels, Ockimey has taken the mantle as Boston's next prominent first base prospect, and he'll get a chance to solidify his place in the organization with a trip to the Arizona Fall League before his Rule 5 eligibility comes up. Second baseman -- Tony Renda, Portland (26 games), Pawtucket (42 games), Boston (one game): Renda had stints in the Nationals, Yankees, Reds and D-backs systems before signing with the Red Sox as a Minor League free agent to provide upper-level infield depth. He did more than that, hitting .318/.373/.453 with five homers, a triple, 19 doubles and 10 stolen bases in 68 games -- performances good enough to get his contract purchased on Aug. 4 to provide cover for the injured Ian Kinsler. Renda got in just one game with the big club but made it count, scoring the winning run in a 5-4, 10-inning triumph at Fenway. The 27-year-old, who also got time at third base and left field this season, remains on the 40-man roster entering the offseason. Third baseman -- Bobby Dalbec, Salem (100 games), Portland (29 games): There's no Player of the Year award when it comes to Organization All-Stars, but if there was, the No. 6 Red Sox prospect would be the runaway winner. Dalbec ranked among the Minor Leaguers in homers (32, fourth), extra-base hits (70, second), RBIs (109, second) and total bases (254, 10th). Overall, he batted .257/.361/.558 in 129 games between both stops. The 2016 fourth-rounder struck out in 32.4 percent of his plate appearances, but with his plus-plus power playing this well in his second full season, he might fit the mold of the modern homer-heavy, K-prone slugger quite well. "He continues to grow as a hitter," Crockett said. "This year, he really understood what guys were trying to do against him, and he used that to make some small tweaks. But for the most part, he stuck to what's always worked for him. Last year, he had his share of homers and doubles, but he was playing through a hand issue. This year, he was healthy and you saw what happened for him. It was a really positive year." Shortstop -- C.J. Chatham, Greenville (19 games), Salem (95 games): The Sox grabbed Chatham out of Florida Atlantic University with their second-round pick in 2016, only to have him limited to seven games due to hamstring injuries the following year. The 23-year-old shortstop wasn't just healthy this season as he played in 114 games, he was impressively productive. Chatham's .314 average between Greenville and Salem ranked second among Red Sox full-season Minor Leaguers. His power was relatively light with 25 extra-base hits and a .389 slugging percentage, but he provided some more offensive value with 11 steals. "It was very positive for him to come off a missed season like the way he did," Crockett said. "He was really making his pro season debut when you think about it. We think he showed impact hit-ability. He'll hit the line drives to the gaps right now, and when you pair that up with his position at short, it was a pretty good thing to see him this way this season." All 71 of Chatham's starts in the field came at shortstop, and with a plus arm and good range, the Florida native has Boston believing he'll stick at the position long-term. If he can do that and continue to show a solid hit tool, he'll make 2017 a distant memory. Rusney Castillo, Pawtucket (117 games): Castillo signed a seven-year, $72.5 million contract with the Red Sox in August 2014 but was outrighted off the 40-man roster in June 2016. He's still getting the money, but if he were to be added back, it would be counted against the luxury tax, diminishing his chances of a return. (Castillo was owed roughly $11.8 million in 2018 but could opt out of the contract after 2019.) That said, the Cuba native continues to produce and was named an International League end-of-season All-Star for the second year in a row. The 31-year-old led the circuit (and all Red Sox full-season batters) with a .319 average and added five homers, 31 doubles and 13 steals. At this point, the 5-foot-9 center fielder might be auditioning for another club willing to take on the last two years of his contract, but those in Red Sox player development remain impressed by his professionalism. "Rusney works really hard," Crockett said. "He's got a prep routine that he relies on daily and he's really focused on doing everything he can to get the most out of his ability. He's a guy who really cares and wants to show that." Jarren Duran, Lowell (37 games), Greenville (30 games): College hitters dominating the lower levels of the Minors isn't breaking news, but what the 2018 seventh-rounder out of Long Beach State was able to do in his first pro summer was special. The left-handed-hitting outfielder/second baseman produced a .348/.393/.548 line with two homers, 10 triples and five doubles in 37 games with Lowell, then continued to show a good bat with a .367/.396/.477 line and 11 extra-base hits in 30 games with Greenville. Duran also exhibited impressive speed; despite his late start to the season, his 11 triples led all Red Sox farmhands while his 24 stolen bases (in 34 tries) ranked third. All of that came after he hit .302/.380/.392 with three triples and 17 steals in 56 games as a junior with the Dirtbags, making him an impressive breakout even by Boston's expectations. "Our scouts did a great job of identifying the tools he has, which are a good hit tool and the ability to drive balls to all parts of the park," Crockett said. "I know Long Beach can be a tough place for power, but he came here at the right time and was able to pick up quite a few extra-base hits. We're happy with the way he's started." Juan Carlos Abreu, GCL Red Sox (45 games), Lowell (seven games): The third time was the charm for the 2016 23rd-rounder. Abreu hadn't hit above .240 or produced an OPS better than .721 in his first two trips to the Gulf Coast League. In 2018, however, his .351 average ranked second in the circuit and his .920 OPS eighth. He also led the complex league with eight triples and was second with 60 hits, third with 85 total bases and ninth with a .497 slugging percentage. Primarily a left fielder, Abreu sported a solid 28/21 K/BB ratio in 195 plate appearances; his strikeout rate dropped from 30.2 percent last year to 14.4. The Florida native finally received the first promotion out of his home state on Aug. 27, and those improvements should be put to the test in 2019, potentially with his first full-season club. 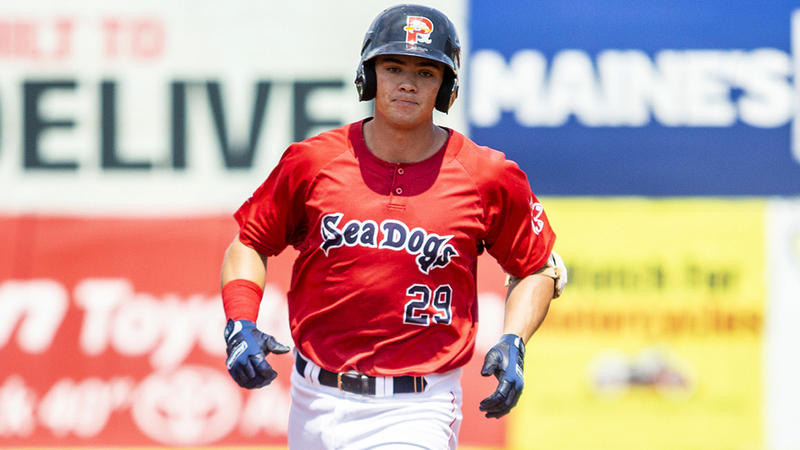 Utility player -- Tanner Nishioka, Greenville (84 games), Portland (three games): Nishioka may have been little-known when the Sox grabbed him in the ninth round out of Division III Pomona-Pitzer, but the 23-year-old made a name for himself in his first full season. He hit .322/.401/.512 with 11 homers, two triples and 20 doubles in 84 games in the South Atlantic League after arriving on June 12. He made 65 starts at third base and 11 at second after starting exclusively at the latter position during his first taste of the Minors in 2017. Having opened the season at extended spring training, the Hawaii native carved a role for himself with his play at the plate. "He doesn't miss mistakes and he's confident in himself," Crockett said. "We're hopeful he can continue to roll along this well. You look at where he was as someone starting the season at extended and finishing hitting third or fourth for a good team. It's clear he's a good athlete with some strength." Right-handed starter -- Denyi Reyes, Greenville (21 games, 18 starts), Salem (six starts): There were few Minor Leaguers better at filling the zone and keeping opposing hitters off the bases in 2018. In fact, Reyes ranked second among all qualified pitchers with a 0.91 WHIP while issuing only 19 walks over 155 2/3 innings. The stellar numbers didn't stop there as he led the system with a 1.97 ERA -- no one else's was better than 3.09 -- and ranked third with 145 strikeouts. The 21-year-old has walked only 2.6 percent of the batters he's faced in his career, and to see him carry that elite control to full-season ball is encouraging. The 6-foot-4 native of the Dominican Republic has moved into the No. 30 ranking among Sox prospects, and though his pitches don't grade out as plus, it's not hard to see him climbing even higher should he post anything close to these results again in 2019. "He's someone who's incredibly consistent with his routine," Crockett said. "That helps him throw all four of his pitches for strikes and, most importantly, he's not afraid to throw the fastball to both sides. He just executes incredibly well. It's that combination of lack of fear with aggressiveness and some deception that allows everything to play so well." Left-handed starter -- Jhonathan Diaz, Greenville (26 games, 26 starts), Salem (one game, one start): Boston's No. 21 prospect also enjoyed a breakout season, especially in the second half, when he posted a 2.19 ERA and 1.00 WHIP with 80 strikeouts and 19 walks over 86 1/3 innings for Greenville. He finished with a 3.09 ERA (second-best in the organization), 151 strikeouts (also second) and 1.09 WHIP over 157 1/3 innings between his two stops. That's a significant improvement over his 2017 campaign with the Drive in which he owned a 4.57 ERA over 88 2/3 frames. The 22-year-old gets above-average grades for his low-90s sinking fastball and changeup but will be tested the higher he climbs as he encounters new challenges. Relief pitcher -- Ryan Brasier, Pawtucket (34 games), Boston (34 games): The story has been well-chronicled in New England. Brasier played eight seasons in the Angels system before getting seven games in the Majors in 2013. After Tommy John surgery in 2014, he spent 2015-16 in the A's system before a year in Japan. The Red Sox signed him to a Minor League deal in March and, seven months later, he was the first arm out of the bullpen in Game 1 of the American League Division Series. In between, he was Boston's most dominant Minor League reliever from Opening Day until he had his contract purchased by the big club on July 8. The 31-year-old right-hander led the system with 13 saves and finished with a 1.34 ERA, 0.92 WHIP, 40 strikeouts and eight walks over 40 1/3 innings with the PawSox. He even posted interesting reverse splits, holding left-handed hitters to a .145 average, compared to .274 by righties. A fastball that averaged around 97 mph and a good slider got Brasier to Boston, and Crockett hopes others in the organization paid attention to his story. "That's certainly an important one for us to tell," Crockett said. "What we're really looking for at the Major League level is whoever is playing best for us in this organization. You're going to get that look if you meet thoe standards. It's important for our players to know that, and Ryan certainly earned everything he got along those lines this season."